For the longest time, Nissan didn’t know how to properly position the X-Trail. From trying to be all for the “active and tough” with the angular first- and second-generation models with the plastic front fenders and roof-mounted lights respectively, the current third-generation X-Trail turns a full 180 and goes all curvy and family friendly. And while they’ve stumbled out of the gate initially, especially when it comes to equipment level, they seemed to have rectified that with the 2018 refresh. Things immediately start to look interesting with the way it looks. Though the execution is still pretty much familial, the new corporate face suits the X-Trail well. The sharper headlights, bigger V-motion grille, chiseled front bumper—they all give a sense of volume lacking before. And while the changes at the back are far less dramatic, ditching the dated “colored reflector inside the clear cover” taillamp design for boomerang-shaped LEDs make one heck of a difference. Bumping up the wheel size from 17s to 19s also seem to improve the stance as well. The good news continues inside with the 2018 X-Trail’s updated cabin. Though there’s still some hard, scratchy plastics here and there, adding leather to the dashboard and shifter base does make its presence felt. Also, the new flat-bottomed steering wheel is a welcome addition that looks great and grips even better. The instrument cluster, while carried over, remains clean and easy-to-understand. From the driver’s seat, the X-Trail feels larger compared to a conventional compact crossover, so thankfully it comes with a nifty Around View 360-degree monitor that helps the driver navigate through tight spots. It stitches the images generated by four cameras mounted around the vehicle to project a bird’s eye view within the car’s proximity. For 2018, it’s made even smarter—it can track moving objects big or small that appear on the central LCD screen. In as much as the system’s smart, it could definitely use some tweaks: the visual warning is hard to decipher due to the LCD screen’s small 5-inch size and low resolution, while the audible warning can be drowned out by outside ambient noise. On the road, the X-Trail continues to exhibit a character that’s far cushier than most. Eschewing any sporty pretentions, everything from the engine to the transmission to the chassis has been geared towards comfort and plushness. Mechanically unchanged, the X-Trail is powered by a normally-aspirated 2.5-liter 4-cylinder motor. The QR25DE makes 171 horsepower and 233 Nm of torque—pretty much mid-pack figures. It feels a bit sluggish off the line, but picks up nicely as it gains momentum. Driven sensibly, it’s smooth with a relaxed vibe. Progress is steady all the way to legal highway speeds for as long as the throttle inputs are deliberate. It’s also mighty efficient too, topping out at 15 km/L on the TPLEX. However, poke the accelerator and ask for some fun and the car will always feel like it’s half a step behind. The culprit is most likely the Xtronic CVT which needs a split-second to adjust its ratios. The X-Trail’s road manners are also pretty much in tune with the drivetrain. At low speeds, the steering is feathery light and the body movements predictable. While it’s not particularly quick or agile, it’s not exactly lethargic either. At medium to high speeds, the steering tightens up with a nice on-center feel. At these circumstances, the softly-sprung suspension does have the tendency to tip and roll through corners, but nothing that’ll be considered excessive. What this car does best is eating up long distances. Together with NVH countermeasures (added sound insulation in the floor and pillars, and thicker rear glass), it’s great on the expressway. Often overlooked, the X-Trail is actually a member of the 7-seater compact crossover club along with the Chevrolet Captiva and the Honda CR-V. Accessing the rearmost seats is easy with a second row that slides forward and back with the pull of a lever. Despite having the longest cabin length in the segment, be warned: the third row is more for children. Even with the second row slid all the way forward, it has barely enough knee room. In short, they’re more of jump seats than full-fledged ones. For this mid-cycle refresh, Nissan Philippines has pretty much answered the X-Trail’s biggest flaw: the lack of equipment. This time, they’ve thrown everything from powered front seats to a panoramic sunroof to all sorts of driver assistive technology under the Nissan Intelligent Mobility umbrella: Blindspot Warning System with Cross Traffic Alert, Forward Collision Braking, Forward Collision Warning, and of course, the Around View Monitor with Moving Object Detection. Honestly, the packaging would have been perfect if not for the lack of a more modern infotainment system with a bigger screen (no Android Auto or Apple CarPlay here) and more standard airbags (it only has, shockingly, two). All in all, the 2018 X-Trail brings some much-needed character to Nissan’s compact crossover offering. While it’s still a bit behind when it comes to driving excitement, it’s more than made up for it with a solid footing based on comfort, intelligent features, and value. 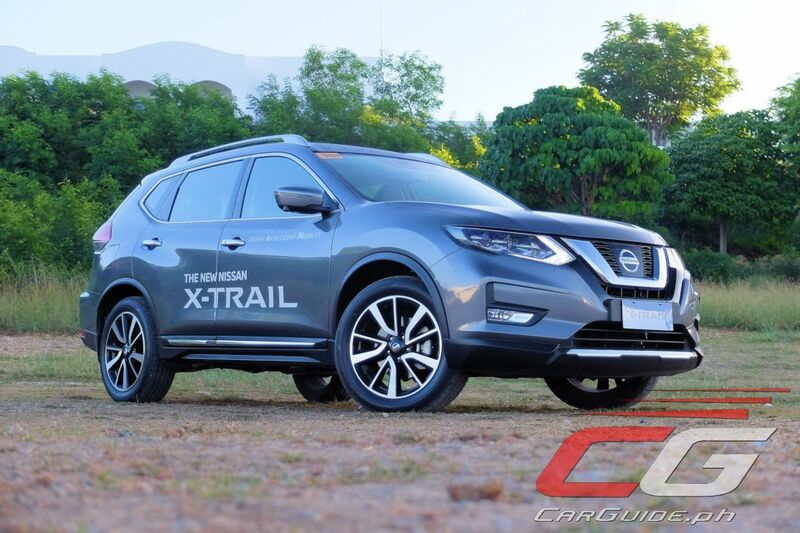 Not only is the X-Trail now equipped with some of the most cutting-edge stuff Nissan has in its arsenal, it’s still priced quite well at P 1,728,000. And by completely embracing its family-oriented character, it’s become a potentially worthy choice in this highly competitive segment. oh my! another great review! Hindi na ako makapag decide, XTRAIL or CRV or FORESTER XT? May Mazda CX-5 na diesel pa, Sta Fe na mas malaki ang 3rd row, saka Rav 4 na... Matibay. Theres a new forester coming next year and outback. The 3rd seats are pretty useless. Why not get the all new XV, cheaper, better cvt, awd, 7 airbags, highest safety award, and that bixer engine. eyesight is coming next year though. I'd pick the XT endangered species na yan. Next year, RIP turbo foresters. This vehicle is as exciting as watching grass grow. I wonder who would buy this, add just around 100k and you get the newer, better equipped and more luxurious CX-5 AWD Spory. It has a better engine and transmission, looks better, more equipment and better material quality and design.You'll really feel and see where that 100k went. Then buy a family van, lol. What does CX5 1.8M can offer? Go mazda ph and read their brochure or watch a cx5 international review on youtube, you'll see.